Pakistan’s National Electric Power Regulatory Authority (NEPRA) has published for public comments its revised feed-in tariffs (FiTs) for solar energy projects of up to 100 MW, according to a report in PV-Tech journal. 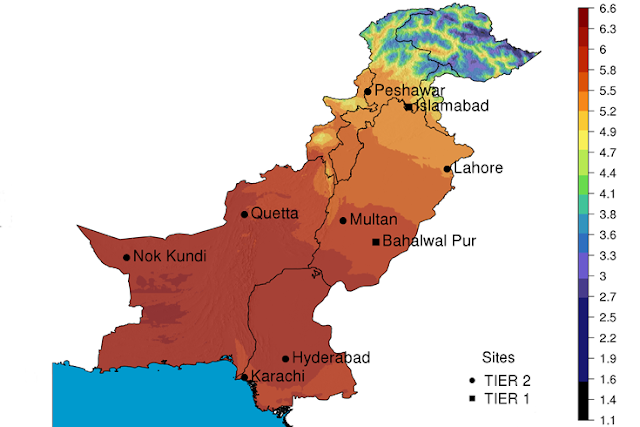 The proposed FiTs are slightly lower in Balochistan, Sindh and Southern Punjab region than in Khyber Pakhtun Khwa (KPK) and the rest of Punjab. The proposal for years 1 through 13 includes Rs. 11.128 (US$0.105) per unit for southern region and Rs. 11.783 (US$0.111) per unit for northern region. The rates drop to Rs. 5.588 (US$0.053) and Rs. 5.917 (US$0.056) per unit for northern and southern regions respectively for years 14-25. The average for the next 25 years works out to Rs. 9.924 (US$0.094) and Rs. 10.507 (US$0.099) per unit for the two regions. Last year, NEPRA, the nation's power regulator, approved a regulatory framework for solar and wind energy for both commercial and residential installations. The framework includes feed-in tariffs for commercial power producers and net metering for residential applications of up to 1 MW. Under the new Net Metering Law, NEPRA, the Pakistani power regulator, will grant power generation licenses to solar and wind system owners. The owners will need to register the critical equipment used, particularly the make and model of inverter and generator used. Among other technical considerations, the generator must also install a manual disconnect device to take the system off the network if necessary, according to details published by PV Tech publication. Net metering is a billing mechanism that pays solar energy system owners for the electricity they add to the grid. It allows a residential customers with rooftop solar panels to generate more electricity than the home uses during daylight hours and sell it to the power supply company. It will require a bi-directional meter (or two separate meters) for implementation. Pakistan has already introduced feed-in tariffs (FiTs) for larger renewable power systems to supply electricity to the national grid on a commercial scale. It paved the way for a 1000 MW Quaid-e-Azam solar park being built in Bahawalpur. Cost of solar power is rapidly declining. However, Pakistan's NEPRA's attempt to cut tariff down from 14.15 cents to 9.25 cents per unit is being resisted strongly by Zonergy Company Limited, a Chinese company working on Quaid-e-Azam solar park power project, according to a story in Express Tribune newspaper. This is in sharp contrast to the record low solar tariff of Indian Rs 4.63 per unit (Pak Rs. 7.19) for 500 MW solar project by US-based Sun-Edison, according to Indian media reports. Pakistan's renewable power policy and regulatory frameworks have drawn praise from international law firm Eversheds which has described the country as “one of the most exciting renewables markets globally, with an abundance of potential”. Alternative Energy Development Board (AEDB) of Pakistan's CEO, Amjad Ali Awan has said that "Pakistan’s renewable market is relatively new but it provides an attractive investment opportunity with compelling structures which make it bankable as well as marketable." Net metering law is necessary but not sufficient to promote widespread use of renewable energy. It will take serious coordinated efforts of Pakistan power regulator NEPRA, the country's nascent solar industry and various utilities like K-Electric to start implementation. Meanwhile, consumers could install a stand-alone rooftop solar system that can be connected to the grid in future. They just need to make sure to select high-quality equipment, particularly inverter and switch, for this purpose which will most likely be acceptable to utilities. Tariff below 10 cents is not possible and it will not work. How are you to get return on your investment. Zonergy made commitment to Pakistan at 12.50 cents. YY: "Tariff below 10 cents is not possible and it will not work." Apparently Sun Edison has figured out now to make money with solar power at record low solar tariff of Indian Rs 4.63 per unit (Pak Rs. 7.19) in India. There have been 3 tricks that have allowed India to get cheap solar power: (1) Reverse auctioning of projects to Indian and foreign companies with 100% FDI allowed (2) Supply of barren government lands through land banks (3) Strict timelines (Letter of intent within 2 weeks, project contracts in 4 weeks of bidding). Also, as an FYI -- the solar power tariff in India has fallen even further now, with Finland-based energy firm Fortum Finnsurya Energy getting the contract at Rs 4.34 for a 70-mw solar plant under NTPC's Bhadla Solar Park. The previous low was Rs 4.63 by the US-based SunEdison that you quote. Some of the other winners included Rising Sun Energy Pvt Ltd (two blocks for Rs 4.35 a unit), Solairedirect (two blocks for Rs 4.35 a unit) and Yarrow Infrastructure (one block for Rs 4.36). From what I know the average solar energy tenders in India are going somewhere between Rs 4.2 to Rs 5.4, depending on the land and location. There are many Indian companies too that are accepting tenders in that range. Rattan India Solar, Yarrow Infrastructure Ltd etc. have all been quoting Rs 4.36/kWh. Even TATAs are now quoting around 4.4 to 5.2/Kwh for solar projects. This is a step in the right direction. By bringing down tariffs they will encourage genuine investors only and disocurage looters- also prevent discoms and consumers from being ripped off. Pakistan is expected to see a sharp jump in operational solar PV capacity over the next few years, as several project developers have signed pacts to set up projects. The Alternative Energy Development Board (AEDB) has reported that as many as 35 solar PV power projects are currently at various stages of development. These projects will have a cumulative installed capacity of 1,111 MW. The largest of these projects will come up at the Quaid-e-Azam solar power park. The project currently has 100 MW of operational capacity. Apollo Solar Pakistan, Crest Energy Pakistan, and Best Green Energy Pakistan are working on 100 MW of solar capacity each. These projects are expected to be commissioned by the end of this year. The total capacity of the Quaid-e-Azam solar park will thus increase to 400 MW against a planned capacity of 1,000 MW. Six other developers have been issued letters of support for the development of projects with a cumulative capacity of 47.84 MW. The ADEB has also issued letters of intent for the development of 25 projects with a combined generation capacity of 663 MW. These projects are expected to be operational by 2018. Additionally, the government of Punjab province has also issued letters of intent for projects with 600 MW of capacity, of which 300 MW of capacity has already secured financing. Several European and Chinese companies have already invested in Pakistan’s renewable energy market. Foreign investors poured over $3 billion into the renewable energy sector in Pakistan over the last year. This is Punjabi Nawaz Sharif government at its extreme. Punjabi federal government has given higher tariff for Punjab North than Sindh, so more plants ventures will go there. Shams: "This is Punjabi Nawaz Sharif government at its extreme. Punjabi federal government has given higher tariff for Punjab North than Sindh, so more plants ventures will go there. " First, the tariffs are based on level of irradiance measured in terms KWh/sq meter in north vs south. Southern region is Pakistan gets 6 or higher KWh/sq meter of gross irradiance while the northern region gets less than 5. Second, the rates Pakistan is offering are much higher than India's. Sun Edison has accepted solar power solar tariff of Indian Rs 4.63 per unit (Pak Rs. 7.19) in India. Clean energy is ramping up in Pakistan. Solar PV and LED lighting solutions are fast becoming pervasive in both rural and urban areas with thousands of small businesses signing up for clean energy. For consumers, it is only logical to move beyond intermittent grid electricity which has proven to be both expensive and unreliable. As per the latest International Energy Agency Report for 2016, clean energy accounted for 70pc of total electricity generation investment, sidelining investments in fossil-fuel based generation by a wide margin. Clean energy investments are led by wind power (37pc), solar PV (34pc) and hydropower (20pc). Amongst countries, China leads the global investment in clean energy generation and continues to invest roughly more than double its investment in clean energy as compared to fossil fuel generation, followed by the European Union, the United States and Japan. Pakistan has taken a different approach towards energy security. The CPEC has shifted the bulk of the new additions to coal and nuclear. Despite this, solar, wind and micro hydro have all taken off. What is really encouraging is the use of solar PV by small and medium businesses amid unreliable and expensive grid electricity. The electricity regular, Nepra, must be given full credit for setting the right sectoral tone by introducing Wheeling, Net Metering and Distributive Generation regulations, all in a short span of time. Consumers have realised that it is grid energy which is intermittent and expensive and not clean energy. At the grid level, consumers are unnecessarily penalised with surcharges and taxes which include tariff rationalisation surcharge, debt servicing surcharge, Neelum Jhelum surcharge, FED, sales tax and other fees. Through all this, the cost of grid electricity is being pushed much higher despite low crude oil prices. Circular debt, as per media reports, is once again hovering in the range of Rs450 billion and the only plausible way to pay it off is via levy of another surcharge. It has become a norm in the sector that those who pay are only asked to pay more for those who don’t pay at all. Pakistan needs to understand the business case for clean energy — primarily the impact on jobs and increase in business productivity. As a country, we too will be adding roughly 1,000MW of clean energy (wind, solar and bagasse) in the next two years but will be adding substantially more from coal and nuclear power. The government needs to realise that the tide has shifted. The old notions that clean energy is expensive and intermittent no longer holds true. With changing times, incentives must be provided to help scale clean energy, provide it with the right eco-system, along with regulations to help consumers shift to improved technologies. Now is the time for Pakistan to truly embrace its clean energy potential, make an early transition and reap the benefits of higher business productivity and increased job creation. Pakistan has updated its 2015 net metering scheme to make it more user friendly. The Government of Punjab, meanwhile, has unveiled a new Access to Clean Energy Investment Program, aimed at installing over 20,000 solar PV rooftop systems. Pakistan has updated its net metering guidelines. Prime Minister Shahid Khaqan Abbasi officially launched the changes at a ceremony in Islamabad on January 3. Overall, the framework is said to have been simplified, while net metering connections can now be gained in less than one month. According to a statement on the Ministry of Information, Broadcasting & National Heritage Government of Pakistan website, Khaqan said issues of service and equipment quality had also been addressed. He added that the key challenge now is to make the system “more efficient and reduce the cost of generation,” of which net metering is part of the plan. Pakistan first introduced a net metering scheme on September 1, 2015. According to Net Metering Pakistan, as of last March 20, the Islamabad Electric Supply Company (IESCO) had connected 56 net metering systems and imported nearly 6 MWh of electricity. The Government of Punjab is also looking to up the solar ante, having introduced The Access to Clean Energy Investment Program, aimed at reducing burden on the National Grid and improving environmental conditions through the implementation of off-grid, decentralized energy solutions. It is looking to install solar PV rooftop systems on all basic health units (2,400), schools (20,000) and public buildings in the province. Among the conditions required for project developers, are the criteria that they have completed at least two similar projects within the last 10 years, and have an annual turnover of Rs. 30.00 Million (around US$270,800) or higher. To fund the program, the government has asked the Asian Development Bank for support to the tune of $87.69 million, which was already approved in November 2016. “The ADB will support broader GoPb provincial government program for providing uninterrupted access to affordable and clean energy, as set out in the respective power sector master plan,” said the government. Overall, two phases have been envisaged for implementing the plan: (i) solar PV rooftop systems on 10,861 schools in South Punjab; and (ii) systems on another around 9,700 schools in Northern and Central Punjab. “The installed solar plants will provide electricity to more than 2.4 million students, including 30% girl’s schools,” said the government. In addition, a 2.5 MW PV system will be installed at the Islamia University Bahawalpur in Punjab by Punjab Energy Efficiency and Conservation Agency (PEECA). And 2,400 basic healthcare units will receive solar PV rooftop installations. According to Bloomberg New Energy Finance (BNEF), Pakistan will see PV installations increase 46% in 2017, up from 700 MW in 2016, to 1.020 GW. Nizam Bijli installs pay-as-you-go solar systems in homes and businesses, where customers pay 2,000 Pakistani rupees ($18) a month over 16 months for three bulbs, one fan and two USB slots to charge their mobile phones. “Now I can eat fish and not worry about bones getting stuck in my throat,” Mohammad told the Thomson Reuters Foundation, describing how he enjoys a well-lit evening meal since his son, Ghulam Nabi, installed solar bulbs in his home three months ago. For nearly a decade, chronic power shortages have hobbled Pakistan’s economy, leaving 144 million people without electricity or enduring lengthy blackouts, the World Bank says. Globally, more than one billion people, or one in seven, lacked access to electricity in 2014 and many more suffer from poor supply, which keeps them trapped in poverty, reliant on wood, candles and kerosene, experts say. These numbers may be grim but young entrepreneurs like Saad Ahmad see this as huge growth potential in Pakistan, which generates only two-thirds of its energy needs. “There is massive opportunity for business,” said Ahmad, 26, chief executive of solar energy supplier Nizam Bijli, which has powered 1,300 homes since it started in 2016 and hopes to reach 1 million people by 2020. A similar ‘off-grid revolution’ is afoot across Africa due to fast-dropping costs and plenty of sun. Currently only four percent of Pakistani households tap into solar power due to lack of awareness, limited supply chains and a shortage of consumer financing for relatively high up-front costs, according to the World Bank. Ahmad believes this is affordable as families spend a similar amount on kerosene and charging mobile phones in nearby towns. The average income in Pakistan is about $1,450, according to World Bank data. Ahmad is certain the only way out of Pakistan’s energy crisis is to bypass the grid and leapfrog straight into low-carbon sources like wind and solar. “The whopping costs associated with grid extension (and) low electricity consumption by rural communities dispersed over large swathes presents a barrier to investment,” he said. Pakistan already has one major solar park in the eastern province of Punjab, built with Chinese investment. Meanwhile, the parliament in Islamabad switched to solar energy in 2016 and sells excess energy it produces back to the grid. Allah Dino’s barber shop in Khorwah, 180 km (110 miles) east of Pakistan’s largest city, Karachi, is connected to the grid. But intermittent power had forced him to close by sunset. Now he has solar, his business is open until close to midnight. “There is never an idle moment and my men now work in shifts,” Dino said. Next door in Bhittai roadside restaurant, solar has also been good for Mohammad Azeem. It allows truckers to stop by throughout the night to drink his tea, brewed on wooden stoves. Solar Guide Pakistan: We have been searching online for information regarding Solar setup in Pakistan but we often end up with a lot of questions about how to calculate the load and how many solar panels are required. Single Solar Panel in Pakistan costs around 12,000 – 14,000 which gives a rated output of 250 watts at peak time. However, the prices of solar inverters vary from 11,000 – 120,000 depending on the brand and capacity. Simply plug it into the socket and save: Small photovoltaic systems for less than 60000 PKR should tap into the sun, without having to deal with craftsmen, authorities and energy suppliers. We tried it. Since solar modules are cheap, the computational production costs for solar electricity are well below the average electricity price paid by private households in Germany. Even without feed-in tariff, therefore, one’s own solar power generation can count, namely by the self-consumption of self-generated solar power. Ultimately, you save costs by buying less electricity from the energy supplier. A mini-system should not only be much cheaper than a “real” solar system on the roof but also save time and annoyance: about assembly, registration with network operators and Federal Network Agency for feed-in compensation and for the replacement of the electricity meter. For less than 4000 you get “regenerated” electricity meter with Ferraris technology, so the classic wheel. Companies such as Go Green Solutions, Infinitum Energy, Minijoule and Sun Invention offer kits that essentially consist of the actual photovoltaic (PV) module and a suitable inverter. Depending on the offer, there are also fastening materials and connecting cables. The assembly of the parts, the assembly at the intended location and the electrical connection should take over the buyer or hire a craftsman with it. But here is already the first rabbit in the pepper: Already comparatively small additional costs jeopardize the economy, so the sense of investment. After all, saving only starts when the PV system has generated its acquisition, installation and possibly repair costs. That lasts even in the best case several years. In addition, acquaintance with the amateur connection to the power grid can cause serious technical problems and risks being taken to account for violation of norms and laws. However, a photovoltaic system can hardly be hidden: after all, solar cells must stand in the blazing sun if they are ever to pay for themselves. Pakistani financier JS Bank has partnered with local solar firm Nizam Energy on a PV module financing solution directed at small and medium enterprises (SMEs). The smart panel solution, named JS Smart Roshni, will allow SMEs that use Nizam’s solar modules and technical services to benefit from financing of up to PKR10 million (~US$86,500) at a mark-up of 6% from the bank, while reducing the SMEs’ dependency on grid power. In other news, the Government of Sindh Province in Pakistan recently rejected submissions from all four bidders in its tender for 352 solar PV systems to electrify primary health facilities. Meanwhile, in February, the Pakistani regulator issued its tariff determinations for 300MW of solar with tariffs significantly below grid parity, for which Nizam was a co-sponser with Scatec Solar for 150MW worth of projects.